Sixty two papers were presented at the symposium, but only two were singled out by IEEE for the Distinguished Paper Award. Among them was the research presented by EPFL scholars and faculty members belonging to the School of Computer and Communication Sciences. 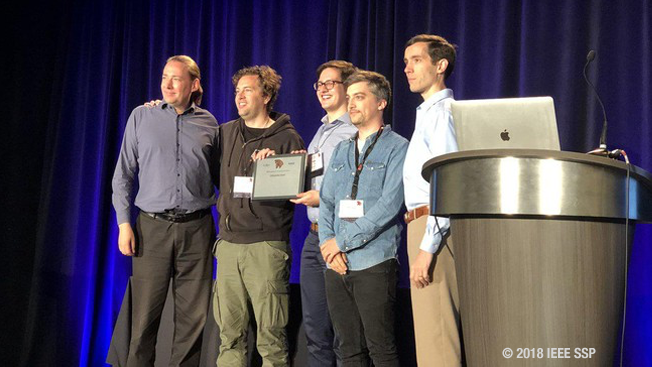 The group that won the distinction for EPFL includes four scholars—Stevens Le Blond, Alejandro Cuevas, Juan Ramón Troncoso-Pastoriza, and Philipp Jovanovic—and Professors Bryan Ford and Jean-Pierre Hubaux. Their paper, On Enforcing the Digital Immunity of a Large Humanitarian Organization, dwelled on the computer-security challenges faced by a large humanitarian organization like the Committee of the Red Cross (ICRC). Based on interviews with dozens of ICRC field workers, the researchers investigated the problems faced by humanitarian organizations in collecting, processing, transferring, and sharing data on sensitive activities. In their study, the writers highlight inhibiting issues such as trade-offs, legal barriers, and data leakages, all of which could severely compromise efficacy. Finally, they propose a set of technological safeguards that can help avoid such hindrances and enhance facilitating factors for effective humanitarian action, which include neutrality, impartiality, and independence.